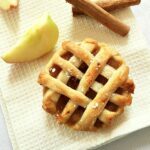 Easy Mini Apple Pies, my take on the all-time classic recipe, vegan friendly. With a delicious apple and cinnamon filling and a fail-proof crust, you know these pies will go down a treat. Perfect on Thanksgiving or any other celebration. Hardly any refined sugar is needed here, since the apples have a natural sweet taste, but do feel free to adjust the recipe, depending on how sweet the apples you use are. 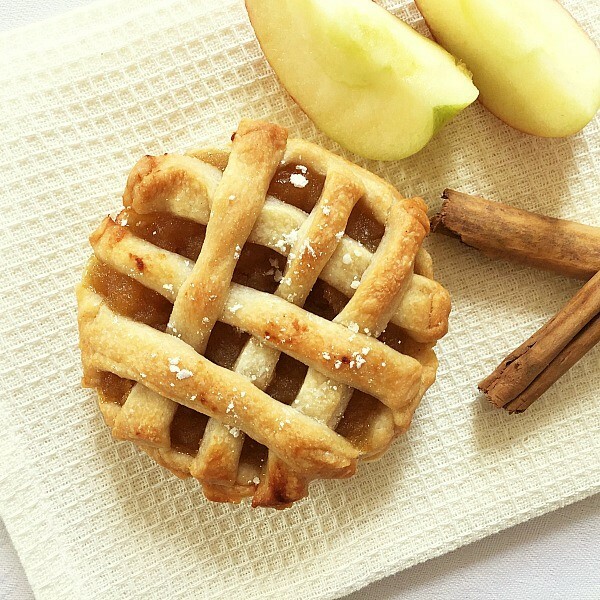 Forget the ready-made pies, these are some seriously gorgeous apple pies that will win you lots of praises. And with just a few ingredients that you always have in your kitchen. Bring on the Fall! But anyway, we all know how life gets in the way sometimes, so if you are short of time, you could use ready-made puff pastry and just follow the other steps, that should work too. We all know the saying “an apple a day keeps the doctor away”. And that’s because, believe it or not, the humble apple is a super fruit that helps us keep healthy and fit. In season or not, apples are always easily available anywhere, and make a great snack in between meals. Shame that we seem to look down on apples nowadays, being more and more fascinated by the choice of exotic fruit. When l think apples, l think cinnamon. You can’t possibly separate these two without causing a major taste crisis; they are so made for each other. One of our biggest concern, when baking pies of all kind, is the so dreaded soggy bottom. Note! If you want a pie crust that does not become soggy, SPRINKLE A BIT OF SEMOLINA over the bottom crust and some more over the filling, that that will retain the moisture and the crust will be baked to perfection. Or, at least, that’s one of the tricks. The apple filling has to be cold, never ever hot before you put it in the oven. These gorgeous apple pies are the ideal Fall dessert, your Thanksgiving dessert choice can’t get any better than that, apart from the obvious pumpkin everything. 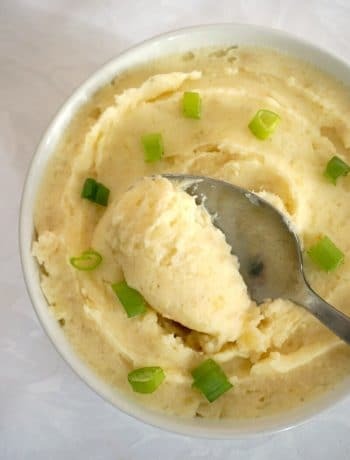 I absolutely love how easy to make they are, and with just a few simple ingredients we all happen to have in the kitchen cupboard. Seriously, apples are the best, ask any child, they will tell you the same 🙂 At least my daughter loves apples, I think she’s so cute when she munches happily on her apple. Are you looking for other Fall desserts? How about these No-bake sweet potato cheesecakes? They are some yummy scrummy absolutely fantastic bites. Yum! 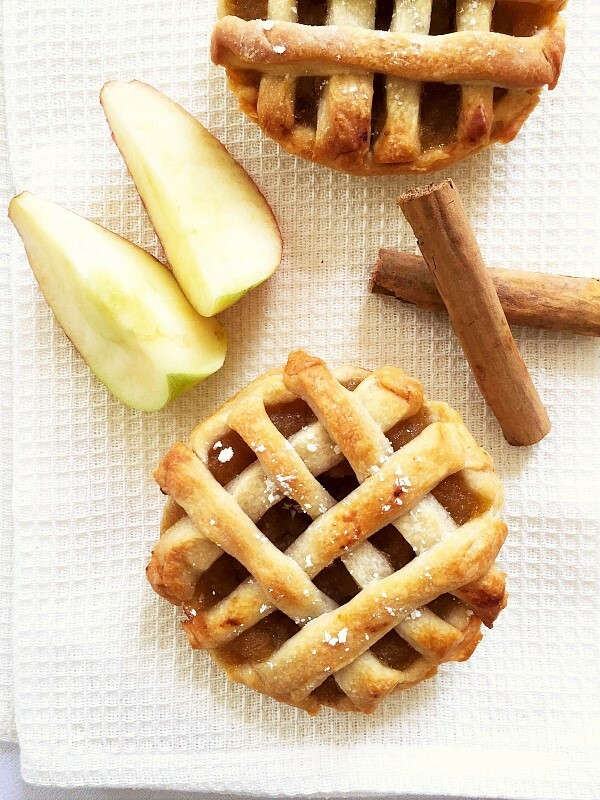 If you’ve tried my VEGAN MINI APPLE PIES or any other recipe on the blog then don’t forget to rate the recipe and let me know how you got on in the comments below, I love hearing from you! You can also FOLLOW ME on FACEBOOK, and PINTEREST to see more delicious food and what I’m getting up to. Easy Mini Apple Pies, Fall's finest dessert. Learn how to make the perfect vegan dessert using one of the most popular fruit: apples. To make the pastry, mix the oil, water and flour in a large bowl. In a cup, add the bicarbonate of sodium with the lemon juice and mix well. Add the mixture to the bowl, together with the vanilla extract. Separately, mix together the 7 tablespoon of oil and flour, and add it to the rest of the ingredients. Knead the dough well for about 5 minutes, this should be elastic and should not stick to the bowl at all. Shape it into a ball, cover with clingfilm and refrigerate for at least 2-3 hours. To make the filling, peel and grate the apples, and add them to a pan together with the cinnamon and vanilla sugar. Leave to cook on a low to medium heat until all the juice has been absorbed and the apples have turned into a brown colour. Roll out the dough and cut 4 circles to cover to bottom of 4 tartlet dishes. Sprinkle semolina all over the bottom dough layer, add a layer of apple filling, sprinkle some more semolina. For the top layer, cut the dough into thick strips and arrange them one vertically, one horizontally. Bake in the preheated oven at 200 degrees C (390 degrees Fahrenheit) until golden brown. Remove from the oven and allow to cool completely. You may sprinkle some powdered sugar on top, but that's totally optional. My dough for the pastry is not at the right consistency… it’s all oily and not at all how dough should be. Please help, is there anything I can do to fix this ? Thank you for your comment. Pastry dough is usually made from butter and flour, but since this is a vegan pastry dough, it uses oil. The consistency will not be like a regular pastry dough, so don’t worry about that. Even if it feels oily, it actually bakes nicely in the oven. Just follow the steps and the pies should turn out ok. This is one of the best apple pie recipes! Firstly, it is sooo easy to make and secondly very, very delicious. 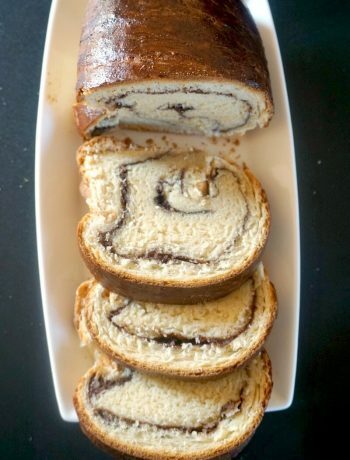 The dough is so nice, I substituted sugar with honey and it turned out amazing. I need to try substiting oil with ghee and maybe try out other gluten free flour.